Quick overview A ground-breaking big-ideas book exploring failure in business, government, and life - from the winners of the 2015 Financial Times/McKinsey Bracken-Bower prize. A groundbreaking exploration of how complexity causes failure in business and life - and how to prevent it. An accidental overdose in a state-of-the-art hospital. The Post Office software that led to a multimillion-pound lawsuit. The mix-up at the 2017 Oscars Awards ceremony. An overcooked meal on holiday. At first glance, these events have little in common. But surprising new research shows that many modern failures share similar causes. In Meltdown, world-leading experts in disaster prevention, Chris Clearfield and Andras Tilcsik, use real-life examples to reveal the errors in thinking, perception, and system design that lie behind both our everyday errors and disasters like the Fukushima nuclear accident. 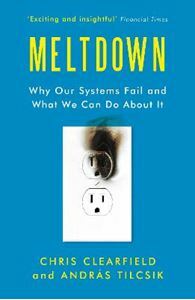 But most crucially, Meltdown is about finding solutions. It reveals why ugly designs make us safer, how a five-minute exercise can prevent billion-dollar catastrophes, why teams with fewer experts are better at managing risk, and why diversity is one of our best safeguards against failure. The result is an eye-opening and empowering book - one that will change the way you see our complex world and your own place within it.